I’ve been looking for a chance to buy the Aussie these days, and the euro could prove to be a viable counter currency with all these Deutsche Bank woes going on. What do you think of this EUR/AUD play? As Pip Diddy discussed in his U.S. session recap, investors are beginning to see signs of unease in the German financial sector as hedge funds started moving their funds out of Deutsche Bank. You see, this well-known bank with strong ties with a bunch of other established financial institutions has been struggling to maintain capital requirements and isn’t dealing too well with the $14 billion in fines imposed by the U.S. Justice Department a few weeks back. Risk appetite took a huge hit because of this, triggering a flight to safety which hasn’t been positive for the comdolls so far. However, I think the Aussie could turn things around at some point, especially since it’s economy has been doing well enough to convince the RBA to let go of its dovish bias. From a technical standpoint, I’m seeing a solid break below the ascending channel pattern on EUR/AUD’s 4-hour time frame. Price has found support around the 1.4600 major psychological level and has pulled up from its dive, retesting the broken support around the 1.4700 mark. 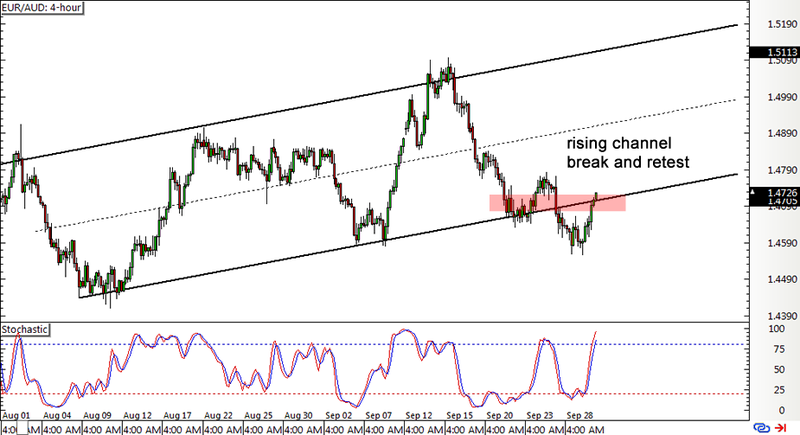 Stochastic is still on the move up so euro bulls might still be in control of price action for now. However, the oscillator is already entering the overbought territory, which suggests that bears might take over soon and allow EUR/AUD to resume its drop. I haven’t set any actual orders yet since I plan on watching how price reacts to this area of interest. The formation of reversal candlesticks could convince me to hop in a small short position, especially if the Deutsche Bank story winds up dragging the euro lower later on in the day.